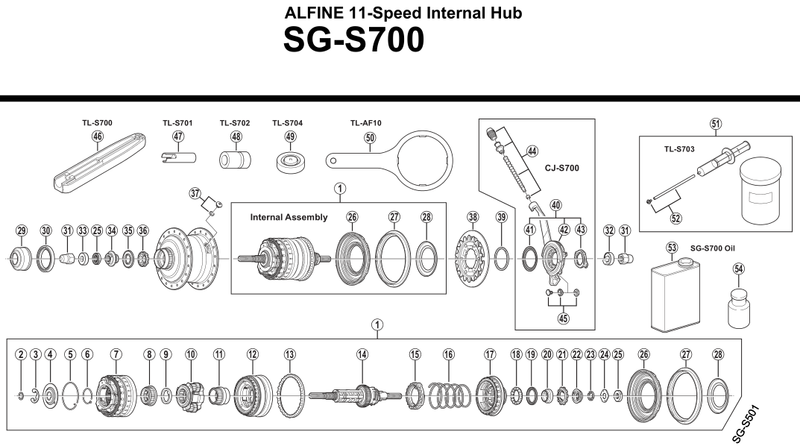 After four years of silent use, the Alfine 11 (the original: SG-S700) has been making creaking noises when pedaling. Since the ball bearing cage of the drive-side ball bearing (part 18) is broken, I suppose the other two ball bearings (13 and 36) might also be worn out by now. So I need to extract the Alfine core assembly from its hub. 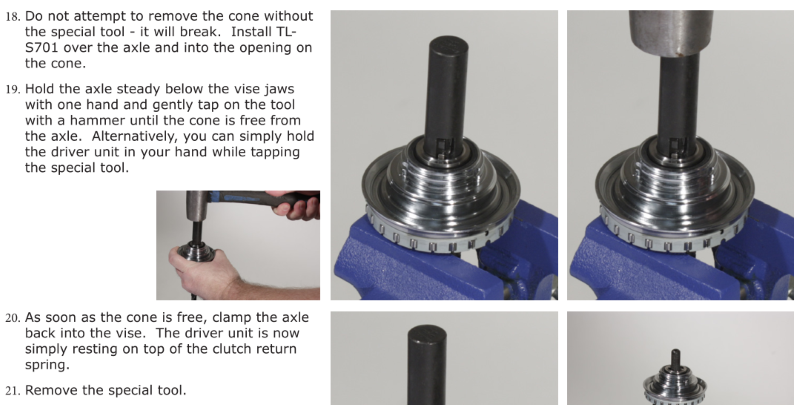 from Dan Burkhart shows how to use the TL-S701 "Cone Removal Tool", but how should I use the two other (TL-S702 Cone Removal Tool and the TL-S704 Mounting Tool) ? 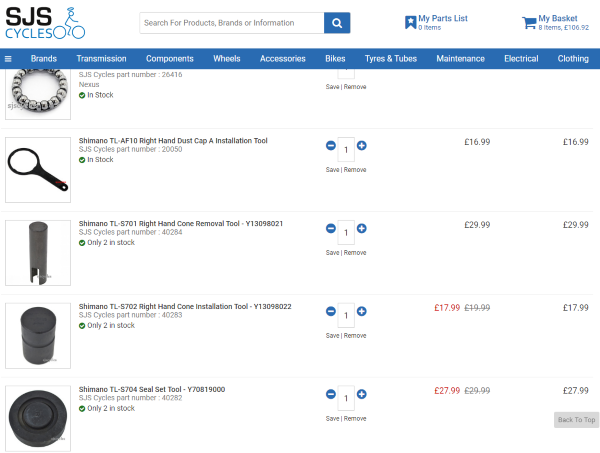 The TLS 701 is the removal tool. The TLS 702 is for setting the drive side cone. TLS 704 is for setting the seals. This hub is oil bath lubricated and requires special seals that the 8 speed does not need. Thanks. Are the TLS 702 and TLS 704 obvious to use, even without any experience working on IGHs ? There is a dealer service manual out there about breaking the A11 down to the axle assembly. If you can't find it, I'll be able to upload it tonight. It assumes basic mechanical competence, but almost nothing else. The directions are very easy to follow. https://si.shimano.com doesn't reply and Google didn't return hits. Attached is the dealer manual for the A11. Unlike the 8 speed hubs, the planetaries do not need clocking during a break-down, since they aren't taken apart. It is rather easy to follow, again, assuming basic mechanical competence. The eight speed planetaries don't require clocking, or phasing, or timing, or whatever term you wish to use, if the carrier assembly is removed from the axle. That is only required if the carrier assembly is further disassembled which is seldom if ever necessary. Thanks a lot for the Overhaul manual ! Pardon my ignorance, but what do you mean with "The eight speed planetaries don't require clocking, or phasing, or timing, or whatever term you wish to use, if the carrier assembly is removed from the axle." ? 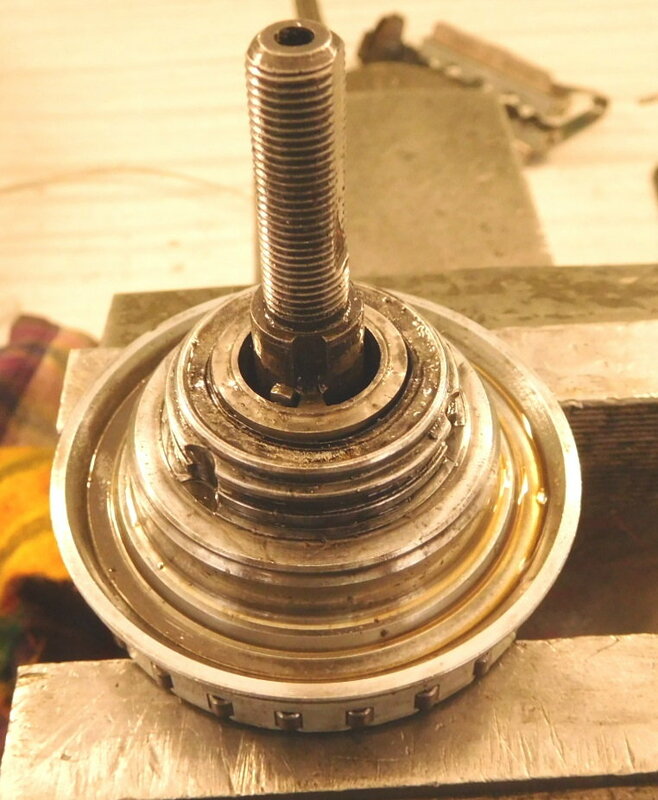 Any geared mechanism with stepped multiple ratios and more than one countershaft, or in the case of planetary gearing, planet pinion shafts, requires that the countershafts or planet pinion shafts be timed,(or phased.) Not something you need to worry about if you don't disassemble the gear carrier. 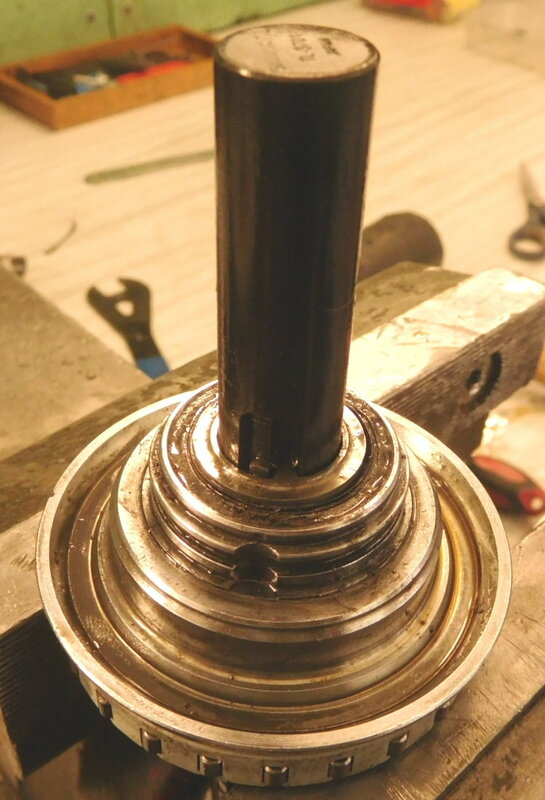 On hubs that do not have a removable gear carrier sub assembly, such as a Sachs 7 speed as shown in this video, phasing the planetaries is a critical step in re assembly. The good news: Even though 1) the bearing balls are still loose on the RHS since I couldn't replace that part after pyring out its broken race, and 2) the other two bearing races looked in good shape so I left them… for some reason, the creaking noise is gone. Maybe some tiny bits of shrapnel from the RHS bearing cage remained in the assembly, and were removed during this operation. I can tell you that the first time it needs to come apart, it requires a scary amount of force to drive the assembly through. If it is damaged beyond repair, PM me. I have a damaged hub with good carriers and new axle assembly that I would part with for a reasonable price. Thanks. Since Shimano said "gently", I didn't dare hitting it harder, but I'll give it another try. After almost five years of daily use, the hub works fine otherwise. It looks like I only need to change the RHS ball bearing. As for the four tools: In Europe, they're available for ~60€ from Bike-Discount in Germany.